This pasta originated in 14th-century Italy. It is an extra-fine spaghetti and was so named because it is as fine as small worms that are found in cheese. Young country girls made the pasta in the summertime and would make enough to last the entire year, drying them in the sun to make them last longer. Boil vermicelli in broth. Drain and add butter, saffron and cheese. Serve hot. 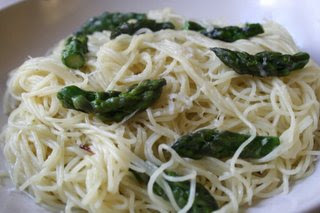 For variety and color, add asparagus.